As CNC router technology has emerged in the wood industry, there have been many questions surrounding parameters of feed rate and RPM of tooling. 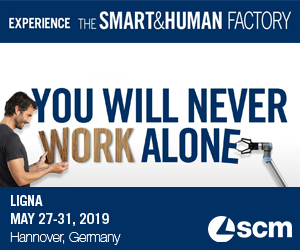 The concepts are fairly simple, but it is not surprising that many operations struggle with these questions once we consider all the variables in machines, materials and tools. In the metal working industry, tooling manufacturers are able to supply exact ‘chip load’ recommendations for every tool. However, steel milling applications are performed with far fewer variables to consider. Material properties are relatively similar and generally more consistent throughout the part. Fixturing and ‘hold down’ of parts is usually reliable and consistent, resulting in minimal vibration or part movement. The existence of flood or misted coolants also provides a critical advantage for cutting tool performance and longevity. 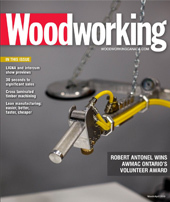 By comparison, wood machining applications are performed under far less consistent cutting conditions. Extreme variation in material density and consistency make decisions regarding cutting parameters very difficult. Furthermore, fixturing and hold down methods are less consistent, which can lead to increased part/tool vibration or part movement. Very few wood cutting applications allow for any type of coolant or misting to be used, which makes cutting speeds a critical factor in preventing heat generation at the cutting edge. There are three important variables that must be managed to prevent heat generation resulting in reduced tool life. The image above illustrates three variables that must be considered. The relationship between these three variables determines ‘chip load,’ which refers to the actual physical size of chip being cut by each flute. Chip load is a critical factor that will dictate the quality of cut and the life of the cutting tool. 6) Speed (RPM) = Feed Rate / (# of cutting edges x chip load). There are numerous ‘chip load calculators’ available online, which are a useful tool for machine programmers and operators. However, not all calculators con- sider all the variables required to make the decision. An Excel version of a chip load calculator Dedicated to CNC Spiral tooling can be downloaded from: www.woodworkingcanada.com/spiralchip. This calculator considers variables such as, depth of cut, tool geometry, and material density and provides a moderate starting point for a CNC operator. Different machines/vacuum systems can achieve various levels of CFM and spoil board leakage can vary depending on design and set up. Of course all these factors constantly change with age, so there is a lot to consider. Smaller parts that commonly move under cutting pressure can be skin cut or multi-passed, to reduce the amount of pressure on the part. Up-shear tools although preferable for tool life reasons, can cause the vacuum to fail as upward pressure influences the part. Use of a lower ‘helix’ or down-shear geometry may be the only option in some situations. A rule of machining at a depth no greater than the diameter of the tool is recommended, but this rule is often broken depending on material density and required cycle time. However, feed rates must be lower based on cutting depth, which can be detrimental to tool life. It is often better to do multiple passes at a higher feed rate to generate less heat on the cutting tool. Extremely low feed rates will cause excessive heat generation and premature tool failure, but an attempt to run a tool too fast, can cause deflection or eventual tool breakage. Starting slower for a SHORT testing period is recommended especially for smaller diameter tools. 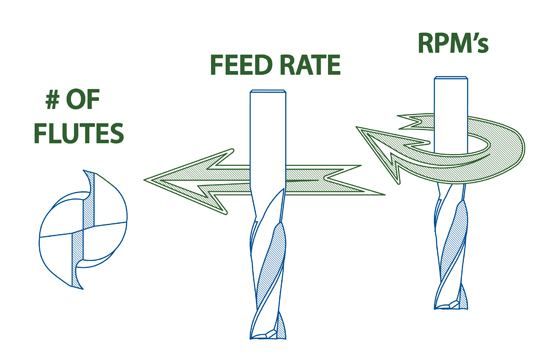 Increase feed rate by 10 percent until cut quality deteriorates, parts move, or tool deflection occurs which indicates a feed rate is too fast. 6) Reduce feed rate approximately 10% or until cut quality is satisfactory, and now you have achieved your optimal feed rate. It is important to note that tool manufactures provide MAXIMUM feed rates that appear on custom drawings and tool etching that should not be exceeded for safety reasons; however this RPM value should not be assumed to be the optimal feed rate of the tool. The process explained above will provide better results once all the factors are considered.